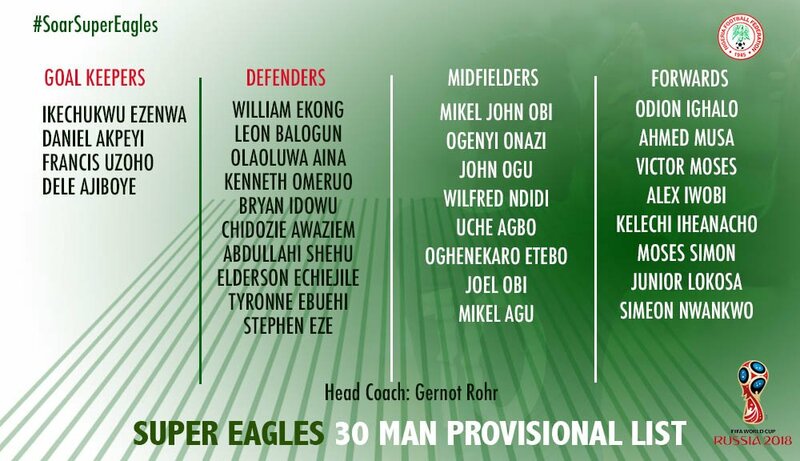 Nigeria Super Eagles coach, Gernot Rohr has released 30-man provisional squad full list ahead of the upcoming 2018 World Cup set to hold in Russia next month. The list drawn comprises of four goal keepers, ten defenders, eight strikers and eight midfielders. Rohr included his regular players, Mikel Obi, Victor Moses, Alex Iwobi and Ahmed Musa. 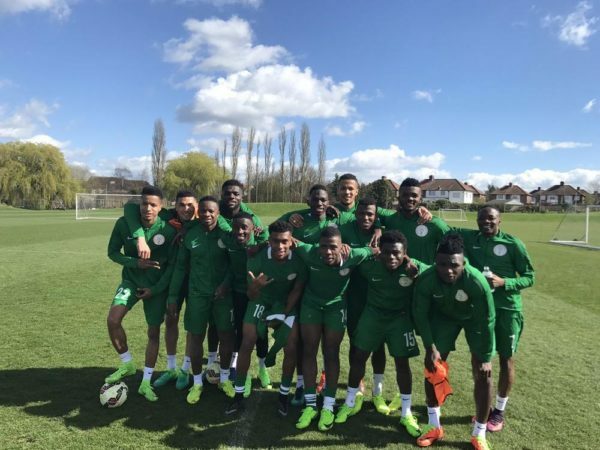 Rohr has till June to cut the 30-man list to 23 players for the Workd Cup. There was a surprise inclusion and first-time call-ups for Crotone of Italian Serie A striker, Simeon Nwankwo. He’s included among other prominent premier league players. However, Brown Ideye who plays as a striker did not make the list. Kano Pillars striker, Junior Lokosa who currently leads the Nigeria Professional Football League (NPFL) goal chart with 18 goals is also in the list. Goalkeepers: Francis Uzoho, Dele Ajiboye, Daniel Akpeyi, Ikechukwu Ezenwa. Defenders: William Troost Ekong, Leon Balogun, Chidozie Awaziem, Kenneth Omeruo, Shehu Abdullahi, Tyrone Ebuehi, Ola Aina, Elderson Echiejille, Brian Idowu, Stephen Eze. Midfielders: John Mikel Obi, Joel Obi, Ogenyi Onazi, Etebo Oghenekaro, John Ogu, Wilfred Ndidi, Uche Agbo, Mikel Agu. Forwards: Alex Iwobi, Victor Moses, Odion Ighalo, Kelechi Iheanacho, Ahmed Musa, Junior Lokosa, Moses Simon, Simeon Nwankwo.